Few mortals know how deep the Fair Lands go, or what manner of creatures dwell in its shadows. These are the strange, wild folk of the old tales: cruel beings who prey on human greed with cursed gold, and invite young men and women to revels from which they never return. 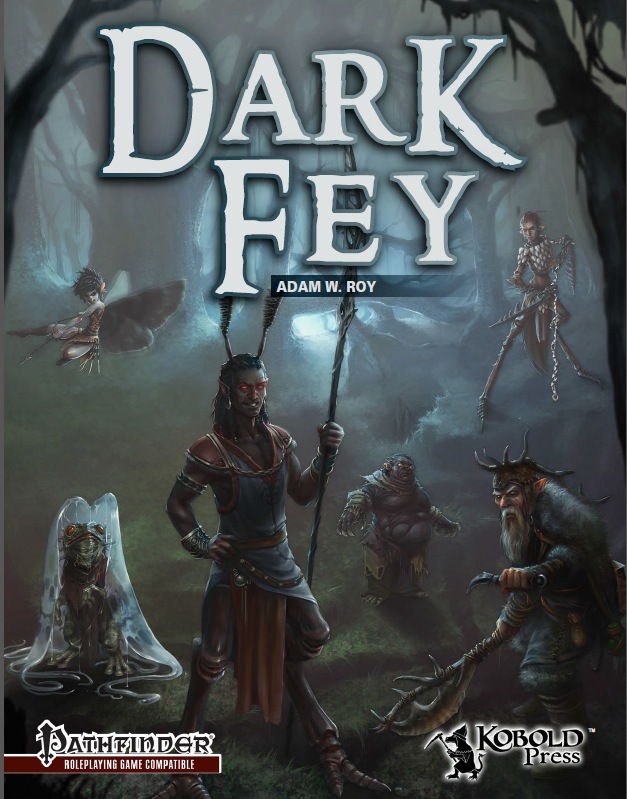 Dark Fey is an essential guide to the fey, usable with the Midgard Campaign Setting or your dark fantasy setting of choice. Get Dark Fey today, and introduce your players to the truth behind the tales! This book has great art, fluff, and layout. There are some fun concepts behind the monsters, and the author has clearly done his research (based on the Designer’s Notes). This is the first time I’ve written a one-star review, so I want to avoid being too harsh. Why one-star? There are many, many cases of errors in the stat blocks, and cases of bad design. For example, there are several cases where size bonuses or penalties are not applied correctly; cases where primary natural attacks are treated as secondary natural weapons (this is where the creature *only* uses natural attacks, not manufactured weapons as well); cases where skills are treated as fey skills, and hence receive the +3 trained bonus, when they should not. There are more errors but these are just examples. For bad design, here are some examples. There is the case of the CR 1 creature having an AC of 26; strange subtypes which are not explained anywhere in the text; having spellcasting at a CL of 16 for multiple spells when the creature is only CR 11; the case of a creature having Multiattack when it only has primary natural weapons; cases where the normal format is not followed, for example, with natural invisibility. All these errors are greatly disappointing. I have prepared a file which took many hours to note the errors and corrections needed, and will gladly forward it to Wolfgang. If or when the corrections are made, I will gladly change the review rating. This mini-bestiary of dark fey is 23 pages long, 1 page front cover, 1 page editorial/ToC,1 page SRD, 4/5 pages of SRD, leaving us with 19 1/5 pages of content, so let's take a look, shall we? The first creature herein would be the CR 6 Aridni, essentially tainted pixie hunters that can shoot arrows that can cause hideous laughter, confusion and similar effects, making them well-suited to their task. Beli on the other hand are the ice-arrows firing servants of the arctic god Boreas, whereas Bereginyas at CR 4 are semi-gaseous and, though tiny, they get a racial bonus to CMB and CMD that not only offsets their size penalty and makes them rather adept at their task - these fey actually try to smother you. Ouch. Boloti are frog-headed humanoids clad in jelly-fish like mantles of water that can cause vortexes and even cause water to sprout grappling tentacles. this is the first fey herein I'd consider truly awesome and original - semi-gaseous smothering fey are neat, the Boloti are downright awesome! Bucca are tiny, poison-using bat-like fey that are vulnerable to sunlight and known for their poison-use. At CR 2 okay, if not particularly awe-inspiring. Chernomoi at CR 1 are essentially the draconic equivalent of brownies. The CR 4 Clurichaun wields antler-glaives that can extend or shrink and disarm or trip adversaries; Combined with their array of SLAs, they make for nice hunter-style adversaries/ hit-and-run foes. Dark Satyrs at CR 6 are...different - with insectile antennae, sleep poison and twisted effects via their piping, these satyr tainted by the Great Old Ones make for one damn cool adversary, both with their signature abilities and SLAs. Domovoi are fighting fey, house spirits turned enforcers and guards at CR 6, while at CR 6 the Dorreqi, balls of twisted tentacles, are the Walker's tainted version of the Korred. The CR 1 Fey Water Strider are water-walking docile insect-mounts - now this one, I really love! An amalgam of dead fish and amphibians, Mamura at CR 5 are aberrations with the (fey) subtype - which does not exist per se. The description is completely awesome and terrifying, though and their reality-bending and concentration-hampering makes them useful and surely an adversary your PCs will not forget. The CR 11 Mavka are undead (again, with the non-existent fey-subtype) dryads, tainted into servitude by vampires, bound to cauchemar nightmares and now vulnerable to sunlight: Once again, excellent prose makes one want to sue this creature! The CR 12 Naina are drake fey with various breath attacks, spells and SLAs as well as shape-changing, make for an adversary that may, thanks to the array of abilities, prove to high-level parties as confusing as faerie dragons to lower level PCs. Qwyllions at CR 8 are bloated, hideous mutations of nymphs, again spawned from the corruption of the Walkers - and they actually get an array of fun abilities as well as a weakness and a heritage feat that marks a character as a former thrall to these disgusting parodies of what once was good and pure. Scheznyki, CR 9 fey resembling essentially disheveled dwarven bums, can be rid of some of their abilities by stealing their hats or cut their beards - which is just awesome and cool! This type of information drives home how alien fey truly are and resonate well with me. And yes, we get full item-stats for the hats. The final fey herein would be the CR 1 Zubnaya, clad in armors of teeth and fighting with tooth-riddled spiked chains, they make for a very disturbing take on the tooth faerie. The pdf also provides the CR +1 fey animal template as well as a list of known Fey of Midgard by Type and one by CR, all featuring the respective source-books in brackets - handy to have. Editing and formatting are very good, though not perfect - still no true reasons to complain. Layout adheres to Midgard's drop-dead gorgeous full-color 2-column standard and the pdf comes fully bookmarked for your convenience. The artworks used herein are insane - beautiful, of top-notch quality and just beauties to behold, one and all of them - they universally made me want to include their depicted creatures in my game. Adam Roy provides us with a cool mini-bestiary that admittedly has a hard standing with me - both Legendary Games and Alluria Publishing have upped the ante so high regarding monster books that it's hard to excite me anymore and at first, I confess to not being overwhelmed. But slowly, though distinctly so, Adam Roy seems to have found his stride - the more I read, the more imaginative and unique the creatures got - to the point where there are some serious strokes of genius herein. Now on the downside, aforementioned awesome artworks are not provided for each creature, nor do we get lore-DC-section of fey-like tricks like the ones mentioned before for every adversary herein. What we do get, though, would be very compelling prose that drives home the weirdness of many of the creatures herein. Also, I'm a sucker for fey and mythos combining into something...different and twisted. Oh, and then there's the VERY low price-point - for the artwork, for the quality of the content, the price-point of this mini-bestiary is more than appropriate and indeed a steal. It is also the deciding factor that made me round up from my final verdict of 4.5 stars to 5 - while not all creatures herein are killer, there is some awesomeness to be discovered in this pdf - if you dare to look, that is. ... and here's a collection of information about them, set in Midgard but easily portable to the campaign world of your choice. Fey congregate in 'Courts' which are not so much geographical but based around the person of their leader, so you can put them wherever you please. There is a bestiary of malevolent fey, beings who will delight in harassing the characters at any opportunity. Each comes complete with illustration, full game stats, descriptive material about how they behave and - lifting the curtain - designer notes as well. There are a full eighteen of them from the nasty little Aridni who associate with slavers to the Zubnaya, another nasty little flying critter that buzzes round your ears lashing out with a spiked chain. Some are larger, all are vicious and best avoided (or culled!). Next comes a 'fey animal' template - the fey often amuse themselves by acquiring ordinary animals and... twisting them. Then come the lists - fey by type, fey by CR, all you need to select the most appropriate one for your needs. A fine array of the foul and grim side of the fey. A very, very fine supplement to any fellnight, shadow fey, Queen Mab, or other twisted variety of fey adventure. Get wicked, folks, these are the bad guys that will catch any player by surprise! And the first review is already up! Is this a compilation of information from old Open Designs, new material or a mix? All-new material and awesome artwork! I LOVE that cover! Now with Designer Notes (tm)!!! Hello, your Majesty, pleased to see you. And thank you for the review, Megan. We went pretty dark with this one, but it pairs with some Paizo and Kobold Press adventures so very well. Dark Fey debuted at #5 on Paizo's Top Downloads From Other Companies list this week! What are all the fey in this book? Can somebody list all 18 if they have time? Thanks if you do this! Thanks Heine! What is the Clurichaun like? Does it wear red like in the real legend? There are Red Caps already in the PF Bestiary 2 (which are excellent, I think Adam Daigle created them), so we didn't feel the need to duplicate an already great monster. In this case, Clurichaun is an old term in Irish/Gaelic mythology, and generally refers to the more vengeful version of Leprechauns. This fey creature came from the idea that the elves of Midgard eat meat, and therefore must have had herdsmen. So our Clurichaun were the hunters, herders and equerry of the Elven nobility. The idea is some stayed behind after the Retreat to help undo the damage of the human rebellions and the Mage Wars. While not inherently evil, Clurichaun are hostile to all humans and will often attack human wizards, magi and sorcerers on sight. They make very good guides, scouts and hunters. They are sometimes found as thralls or rangers for the Red Hags of Midgard, especially in the duchy of Verrayne. Of course, they were designed to be as flexible as possible, with a singular magical attack ability, to make them easy to drop into any wooded campaign area, as a fun and unique challenge (or ally?) to any low-level party. Enjoy! Hey, wow! Dark Fey debuted at #5 on Paizo's Top Downloads From Other Companies list this week! Congrats one and all! Thanks, Marc! This one sat on the easel for a long time, while we fiddled with the colors and shapes and forms, as it were, to make sure they were just right. Glad everybody seems to like it! Thanks to everyone who worked on this and made it look great, esp. the artists, and the rules developers/playtesters, who make me look smarter than I actually am; and to Wolfgang, for getting it out there for everyone to have fun with it! Thanks again! Well that's certainly different from the Cluricaune I was thinking of (drinks all alcohol in a large radius without needing to touch the bottles, the terror of taverns). Sometimes you gotta tweak the legends a little, just to keep the players on their toes. The PF Bestiary 2 already has classic/legendary Leprechauns and Red Caps, so we were going in a different direction in order to fill in other gaps in the fey line up...hope you enjoy playing them as much as I enjoyed writing these nasty little beasties...! Clurichaun and Redcaps don't have anything in common spare for the colour red in their clothes. Their behavior is very different in legends, I just would like a Leprechaun dressed in dark red, not because it dipped its clothes in blood like redcaps (which only dip their hats in blood, not their entire outfit) but because a leprechaun dressed in dark red would look awesome and grim. It's true, that Cluricaune was one of the first contributions to Kobold Quarterly by Scott Gable. Good stuff. What do subtypes such as fey (outsider), fey (drake, esoteric), aberration (fey) mean? Also, typo, in the Aridni entry greater invisibility is listed as both spell-like and supernatural ability. What do subtypes such as fey (outsider), fey (drake, esoteric), aberration (fey) mean? Also, typo, in the Aridni entry greater invisibility is listed as both spell-like and supernatural ability. Good questions, Necromental - those are both typos - it should be "greater invisibility (Su)" (supernatural, not spell like) and fey (aberration), not aberration (fey). As far as the subtypes go, it means for any relevant rules application, they are treated as the base type of creature with the fey template acquired or inherited. Thanks for the catches! Wolfgang and I will have Marc fix those going forward. Oh, the esoteric part of the drake listing is a subtype from Book of Drakes, by Adam Daigle and Mike Welham. There are also Geographic and Material drakes, for instance. These are similar to the subtypes of Humanoid (elf, dwarf etc). The fey template is in Bestiary 3. It's confusing because fey is also a base type. I suspect the editor should have queried or sort this out. Oh, and Dark Fey is in the bestseller list for non-Paizo downloads this week! Congrats, Adam. I love that review, End; I'll be getting this one by month's end because of it. Especially the info on the corrupted dryads. Thanks for the trust, Eric! Believe it or not, I was thinking that this one would probably be right up your alley, judging from your taste in supplements you've reviewed. Thank you for the review, EZG! Am I missing something, or are the draconic brownies missing their breath weapon from the fluff in the stats?